This post was sponsored by Thrive Algae Oil. Thanks for supporting the brands that make this blog possible! It officially hit 90 degrees this week in Columbia, so even though it technically is still spring, it’s time for summer grilling. Alas, this recipe for grilled spring vegetables with miso-lime dressing! Guys, I just want you all to know that I conquered my grill-phobia to bring you this dish. Last year when I was hosting a wedding shower for my sister-in-law, my grill blew up in my face while lighting it. Apparently, letting the propane run too long before using a lighter to ignite it is not a smart idea. Thankfully, my eyebrows survived, and I was still able to whip up a killer grilled potato salad for the party. But since then, I’ve been way too afraid to attempt to light my grill on my own! I made this recipe using Thrive Culinary Algae Oil, the same oil I used to make this grilled naan pizza with kale pesto and heirloom tomatoes last year. You might wonder why on earth someone would want to cook with algae oil, but I promise it’s not as weird as it sounds! With 13grams per serving, it’s got the highest levels of monounsaturated fat, the good kind that helps maintain heart health. It also has the lowest percentage of saturated fat with .5 grams per serving. Since I discovered Thrive Algae Oil, it’s become my favorite neutral flavored oil for cooking. In the dressing, it’s neutral taste let’s the flavor of the miso, lime and ginger shine through. It’s also the perfect choice for grilling, since it has a high smoke point of up to 485 degrees. 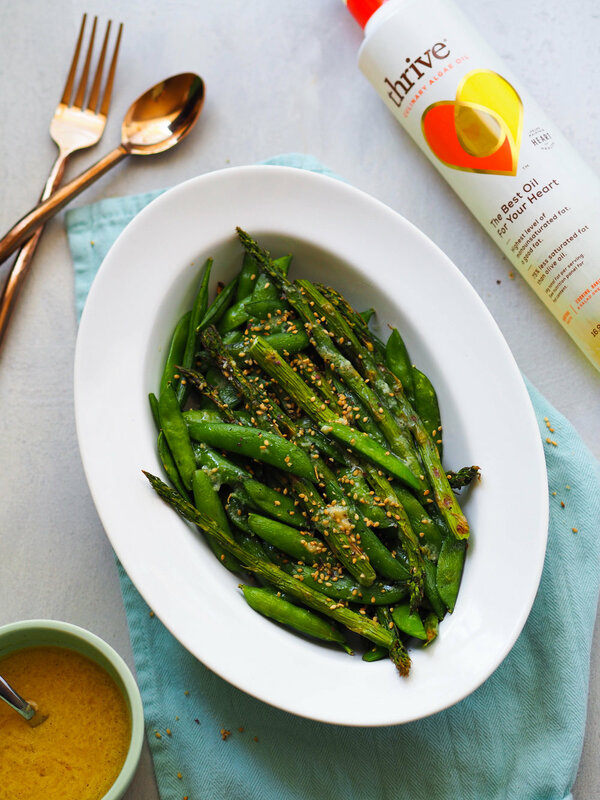 If you’d like to try Thrive yourself, head to your local Publix and pick up a bottle while you’re there so you can make my grilled spring vegetables with miso-lime dressing next week! Keep an eye out for occasional in-store tasting demos too. If you're not from the South, you can use their store locator or find it on Amazon! This recipe makes extra dressing, which you’ll have no problem finding ways to use up. I think it would be really delicious drizzled over grilled or slow cooked salmon - I use this recipe from my friend Kara. You could also use it in place of the carrot-ginger dressing I use in this simple avocado salad. I also love the idea of creating a spring inspired grain bowl with quinoa and using this for a dressing. It’s so bright and fresh tasting, plus it’s got a boost of probiotics from the miso paste! In a medium bowl, whisk together lime juice, miso paste, ginger, and garlic. Slowly stream in oil, while whisking, until dressing is emulsified. Season with salt and freshly cracked black pepper to taste. Heat grill on medium-high heat. Toss vegetables with oil and season with salt and black pepper. When the grill is hot, spread vegetables evenly on the grill and cook the snap peas for about 1 minute per side, and the asparagus for about 1-2 minutes per side. If you have a grilling basket, you may want to use this for the snap peas to keep them from falling through the grates. When vegetables are lightly charred but crisp-tender, remove to a serving plate, drizzle with dressing and sprinkle with sesame seeds or gomasio.